Reference of Dropped Messages metrics available for dashboard graphs and alerts in OpsCenter monitoring. 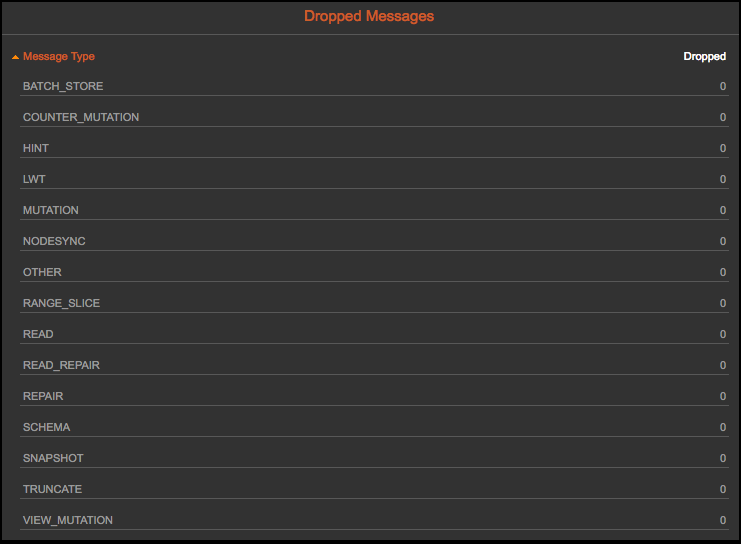 A tally of dropped messages for a node can be viewed in the Dropped Messages pane of the Node Details dialog. Dropped messages can indicate system stress that could impact node health. Aggregate of all messages that have been dropped server-side due to not having been processed before their respective timeout. Batch store message was seen after the timeout so was thrown away. Mutation was seen after the timeout (write_request_timeout_in_ms) so was thrown away. This client might have timed out before it met the required consistency level, but might have succeeded as well. Hinted handoffs and read repairs should resolve inconsistencies but a repair can ensure it. Hinted Handoff was seen after the timeout (write_request_timeout_in_ms) so was thrown away. Repairing the data or using NodeSync, should resolve data inconsistencies. Lightweight Transaction was seen after the timeout (write_request_timeout_in_ms) so was thrown away. This client might have timed out before it met the required consistency level, but might have succeeded as well. Hinted handoffs and read repairs should resolve inconsistencies but a repair can ensure it. Mutation of Materialized View was seen after the timeout (write_request_timeout_in_ms) so was thrown away. This client might have timed out before it met the required consistency level, but might have succeeded as well. Hinted handoffs and read repairs should resolve inconsistencies but a repair can ensure it. Miscellaneous message was seen after the timeout so was thrown away. NodeSync message was seen after the timeout so was thrown away. A local ranged read request was received after the timeout (range_request_timeout_in_ms) so it was thrown away because it would have already either been completed and sent to client or sent back as a timeout error. A local read request was received after the timeout (read_request_timeout_in_ms) so it was thrown away because it would have already either been completed and sent to client or sent back as a timeout error. The Mutation was seen after the timeout (write_request_timeout_in_ms) so was thrown away. With the read repair timeout, the node still exists in an inconsistent state. Repair message was seen after the timeout so was thrown away. Schema change was seen after the timeout (request_timeout_in_ms) so was thrown away. Schema agreement may not have been reached immediately, but this will eventually resolve itself. Snapshot Request was seen after the timeout (request_timeout_in_ms) so was thrown away. Snapshot should be retried. Truncate operation was seen after the timeout (truncate_request_timeout_in_ms) so was thrown away. After clicking Add Metric to add metrics and clicking Save Graph, the graph appears on the monitoring dashboard. 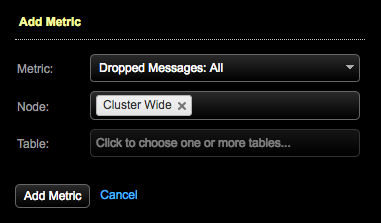 Tip: Clone the Default preset tab and give it a name such as DroppedMessages to organize your dashboard. No messages are being dropped for NodeSync in this example. 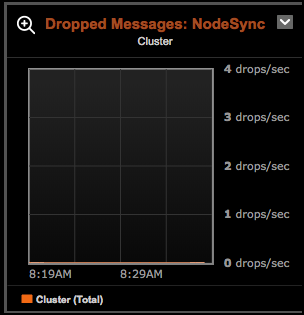 Alerts are available for all dropped messages metrics. Click Alerts > Notify me when > Advanced > Cassandra > Dropped Messages: metric in the Add Alert dialog. Define the notification criteria for each alert required for monitoring your environment.